There is a long history of athletics in Ilkley. 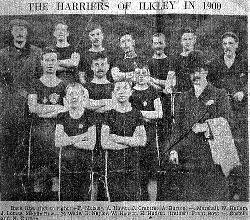 The photo shows 'The Harriers of Ilkley in 1900' - the archives in Ilkley Library suggest that main activities back then were sprint races and handicaps. Initially, there were about 40 people in the Club. The Club got off to a 'running start' because since 1985 a group of Valley Striders runners had been organising Wednesday night training runs from Ben Rhydding Sports Club - Rupert Road reps and the Big Dipper were introduced at that time. The first Club run for the newly-formed Ilkley Harriers was on Wednesday 7th May 1986 and Richard Gray's training diary records "10.30 mi, 70:08, Ben Rhydding to Otley Bridge and back via Askwith - hard work". Early member Norman Blackburn notes that the first Committee of the modern club (Derek Jones Chair, Ian Dalby Captain, Mick Lambert and Dave Smith) were keen to get the club whipped up enthusiasm for a schedule of races which would help to put the Harriers on the map and generate club spirit. There were many club outings which were attended by a coach load (literally) of Harriers: the Morecombe Ten, the Bridlington Ten, the Tadcaster Ten, the Clitheroe Ten, the Brass Monkey Half and many more. A local annual inter-club Tournament was set up, where each club sponsored and held a race, much like the current Harrogate League. The Harriers developed the precursor to the Ilkley Moor fell face for this Tournament. The first Harrier home in these races, made a point of jogging back down the course to applaud and encourage those still finishing, to the last man. A tremendous club spirit emerged, which was reinforced by the ethos that training runs would stick together and would re-group, so that no-one felt excluded or got left behind. Team spirit was also developed through the Christmas Children's Party and Handicap Race - with many in fancy dress - and the Harriers Christmas Ball. The Committee continued to put the new club on the map by entering teams for prestigious events and established a tradition of competing in the Ian Hodgson Mountain Relay and the National Championships with commendable results. In that first five years the memberhip rose to about 80 runners. The membership has continued to change in the years since and continues to thrive. Some of the original 1986 founding members who still remain are Steve Cockerham, Ros Blackburn and Richard Gray. 1990: the Club inaugurated the Ilkley Moor fell race, our longest-running event which will celebrate its 25th anniversary in 2014. 1993: the Club joined what is now the Harrogate District Summer Race League, and started organising HRL races in 1994. 1995: the Ilkley Harriers Race League was started. 1999: the Club went online with its first website (and obtained the domain name a year later). 2001: members voted to move from Ben Rhydding Sports Club to Ilkley Lawn Tennis and Squash Club. 2002: the Ilkley Incline race was inaugurated by the Club, as something for both fell and road runners. 2003: we incorporated a junior section to accomodate the huge demand in Ilkley for junior athletics, and in August 2005 Mary Gibbons was the first Junior Harrier to progress to the senior section. 2008: we staged the inaugural Ilkley Trail Race, based on the old Middleton Trail Race. 2008: In the England Athletics Yorkshire and Humberside Club Awards, Ilkley Harriers was Junior Club of the Year. 2010: the Club attained ClubMark certification. 2010: the Club took on the organisation of and revived both the Will Ramsbotham Badgerstone Relays and the Addingham Gala fell race. 2011: the Club celebrated its 25th Anniversary. Hurrah! 2012: we celebrated Olympic year by joining with Ilkley Swimming Club to organise the inaugural Ilkley Aquathon. Thanks to those who have contributed to this history: if you have any more information, please contact us.